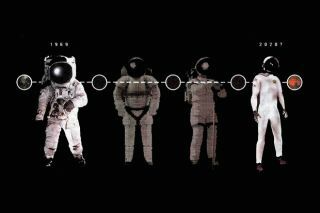 The evolution of the spacesuit, from large and bulky, to streamlined and light. CAMBRIDGE, Mass. -- Future explorers on the Moon and Mars could be outfitted in lightweight, high-tech spacesuits that offer far more flexibility than the bulky suits that have been used for spacewalks in the 1960s. Research is under way at the Massachusetts Institute of Technology (MIT) on a Bio-Suit System that incorporates a suit designed to augment a person's biological skin by providing mechanical counter-pressure. The "epidermis" of such a second skin could be applied in spray-on fashion in the form of an organic, biodegradable layer. This coating would protect an astronaut conducting a spacewalk in extremely dusty planetary environments. Incorporated into that second skin would be electrically actuated artificial muscle fibers to enhance human strength and stamina. The Bio-Suit System could embody communications equipment, biosensors, computers, even climbing gear for spacewalks or what NASA calls an Extra Vehicular Activity (EVA). "When we get back to the Moon and on Mars, we're not going there to stay in a habitat," said Dava Newman, professor in the Department of Aeronautics and Astronautics and Engineering Systems here at MIT. "EVA becomes ... a primary function," she said. Newman is leading the Bio-Suit System work, assisted by researchers Kristen Bethke, Christopher Carr, Nicole Jordan, and Liang Sim in the Department of Aeronautics and Astronautics and Engineering Systems. The study is multi-pronged and is intended to better calibrate astronaut performance, explore improvements to current spacesuit designs and generate novel ideas for a new generation of space exploration suits. The NASA Institute for Advanced Concepts, headquartered in Atlanta, is sponsoring the Bio-Suit System effort. "We need to shrink-wrap the astronaut," Newman said. "It would be like wearing a second skin." The Bio-Suit System, Newman said, would provide life support through mechanical counter pressure where pressure is applied to the entire body through a tight-fitting suit with a pressurized helmet for the head. Ongoing research is targeted at understanding, simulating, and predicting capabilities of suited astronauts in a variety of scenarios -- be they performing simple motions or more complex movement, such as overhead or cross-body reach, stepping up, or trudging across an exotic landscape. The scenario envisioned by Newman and her associates is an astronaut first donning his or her customized elastic Bio-Suit layer. Then a hard torso shell would be slipped on, sealed via couplings located at the hips. A portable life support system is then attached mechanically to the hard torso shell and provides gas counter pressure. Gas pressure would flow freely into the wearer's helmet and down tubes on the bio-suit layer to the gloves and boots. Newman said that the spacesuits of today are very limited in terms of mobility. In addition, the current weight or mass of EVA suits is another limiting factor. "In the microgravity environment those limitations are not show-stoppers. But for an advanced exploration spacesuit for the Moon or Mars, unlimited mobility and a very low mass spacesuit are paramount," Newman told SPACE.com . There are several advances in technology that Newman and her MIT colleagues consider key in turning their work into a practical, suitable suit for human space explorers. "We're looking into cutting edge materials, development and modeling capabilities to turn our Bio-Suit concepts in to working prototypes implementing mechanical counter-pressure," Newman advised. Newman said Bio-Suit relies on advances in fabrication and application of open cell foam, smart materials like advanced "muscle wire" technologies, and electrospinlacing. "All of these have seen vast improvements in the last few years," she said. The MIT group has investigated unique modeling techniques, such as taking 3D laser scans of a person. Then, using mathematical modeling and mechanics techniques, a "stress-strain field calculation" is performed for the entire human body. "The modeling allows us to prescribe a minimum energy suit that literally could be 'painted on' to provide maximum mobility for extreme exploration required on the Moon or Mars," Newman said. Lightweight and easy to don and doff, the bio-suit layer would be custom fitted to each astronaut -- made possible by a laser scanning/electrospinlacing process. That method stems from work at the U.S. Army Soldier Systems Center in Natick, Mass. where researchers there are tapping into science and technology for 21st century combat uniforms, as well as police officer garb able to thwart chemical or biological agents. In addition, the MIT Bio-Suit System team is working with Mide Technology Corp. of Medford, Mass. to adopt such items as micro-actuators and smart (active) materials in their designs. Among other collaborations, Bio-Suit System researchers are also drawing upon the Institute for Soldier Nanotechnologies, an interdepartmental research center at MIT. The ultimate goal of that institute is to create a 21st century battlesuit that combines high-tech capabilities with light weight and comfort. "The roadmap that the president and NASA have established involves spiral development and multiple destinations and operating environments over a relatively short period of time. With the very real budget pressures we will all face, I think the most critical element for success will be the early creation of an effective, modular EVA system architecture," said Edward Hodgson, a Technical Fellow at Hamilton Sundstrand Space Systems International in Windsor Locks, Conn.
Hodgson said an evolutionary approach will permit changes in response to altering mission needs, and also to infuse new technology as it develops with a minimum of system level redesign and recertification. Hodgson has also received support from the NASA Institute for Advanced Concepts to study a "Chameleon Suit." The name reflects the fact that walls of the suit change in response to variations in the environment or in the wearer's need for cooling. The ultimate goal of this concept is a symbiotic interaction of astronaut and spacesuit like that between humans and terrestrial plants in which the astronaut's waste carbon dioxide and water vapor are converted back into respirable oxygen in the suit walls using environmental energy sources. Technologies under study, Hodgson noted, include shape change polymers and electro-emissive materials to modify heat transfer characteristics of the spacesuit skin so it is similar to that found in natural biological systems.